i have setup my project with Ninject IoC. 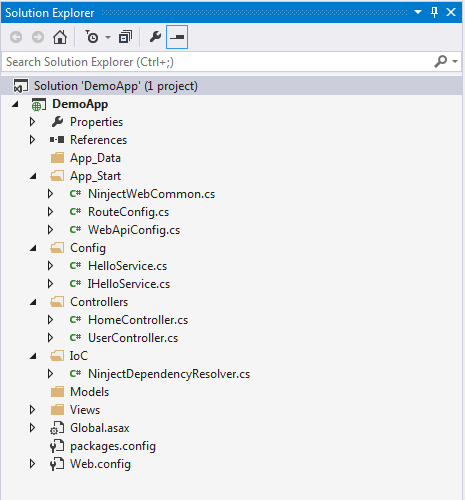 My project has regular Asp.Net MVC controllers and Web Api controllers. 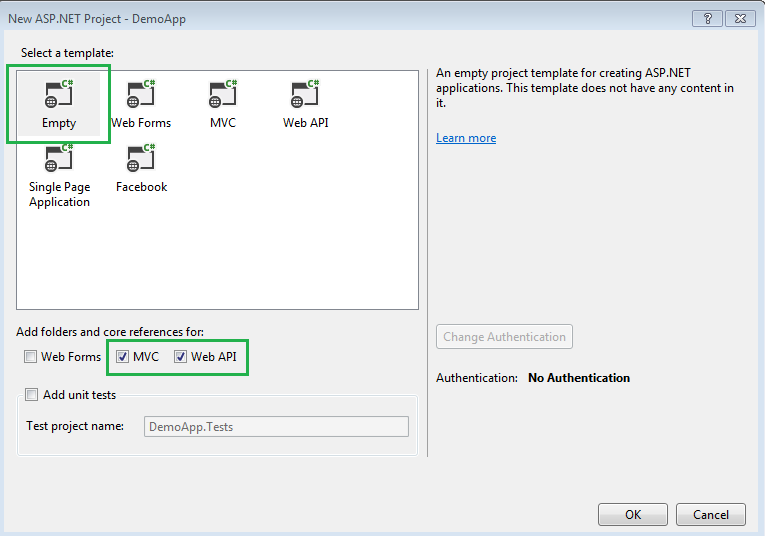 Now, Ninject works with Web Api but Ninject doesn't work with regular Asp.MVC controllers. // Save pending changes to the data store. // These registrations are "per instance request". To add Bindings for concrete Types, Just put them in the Load() method of the MainModule. You can create as many modules as you like to keep bindings organized. but you'll also have to add them to the array that is returned in the Modules property. UPDATE: Remember to Remove NinjectWebCommon.cs from your project as it loads and bootstraps a new kernel at Runtime which unfortunately is only for MVC. This installed other Ninject dependencies and allowed me to RegisterServices through NinjectWebCommon.cs. After searching a lot, it turns out there we can't use Ninject with web api and regular mvc. I mean, we have to configure the Repositories separately. I think the issue is that you are not registering a ControllerFactory that uses Ninject to build the controllers (and resolve their dependencies), have you tried implementing your own ControllerFactory yet? See also here http://bubblogging.wordpress.com/2012/06/04/mvc-controller-factory-ninject/. There is a more elegant solution for this by Nenad - it took me 3 extra hours because I first tried to implement the solutions here conflicting with existing infrastructure I had. It is in reply to another stack overflow question. I am duplicating that answer here just in case it helps others to save the time I lost. There is a way to share same container between MVC and ASP.NET Web API. You just need to implement both interfaces. Not the answer you're looking for? Browse other questions tagged asp.net asp.net-mvc dependency-injection ninject repository-pattern or ask your own question. Do I need to register Ninject.OnePerRequestModule with Ninject.Web.MVC 3.0?